Oreo Chocolate Chip Cookies - What's In The Pan? These Oreo Chocolate Chip Cookies are absolutely amazing and are full of Oreo chunks! They are just like those thin and moist bakery style cookies with crispy edges that look so tempting in the store. I made them for my son’s birthday together with this No Bake Oreo Dessert, and kids just loved them! But the interesting part is that adults loved them even more! We ran out of them before I had a chance to grab a piece for myself. And I keep getting requests to make them again. I recommend using a combination of dark brown sugar and Turbinado sugar here. You will really enjoy the taste, moisture and crispiness that these sugars add to cookies. However, if you don’t have Turbinado sugar, or can’t find it at the store, just use the same amount of light brown sugar in its place. I linked it to Amazon only to show you what this sugar looks like and how nice and dark it is. It’s available in most grocery stores either on the shelves next to regular sugar or in the natural section. It renders absolutely beautiful brown color for these cookies. It also makes them crispy and moist. Organic sugar is never treated with herbicides or synthetic fertilizers, or Glyphosate. On the other hand, non organic cane sugar in the US is sprayed with Glyphosate (or Round-up). Use of glyphosate has been proven to disrupt gut bacteria which can lead to gluten intolerance, autoimmune diseases and development of food allergies – Glyphosate, pathways to modern diseases. It’s very delicious-tasting unrefined brown sugar! You can use it in baking for amazing results! If you want thicker cookies, make sure to chill the dough for at least 1 hour or overnight. I like my Oreo chunk chocolate chip cookies thinner rather than thicker, so I don’t chill them at all and to put them in the oven as soon as they are done. Plus the cookie dough smells too good for me to not make them right there. Chilling the cookie dough will definitely make them bake up thicker. Preheat oven to 350 degrees F and line a large cookie sheet (or better – 2 cookie sheets) with parchment paper. PREPARE WET INGREDIENTS: Mix 1 stick softened butter, ¼ cup turbinado sugar (or light brown), ½ cup dark brown sugar with a handheld mixer on low speed until well combined. Add 1 egg and 1 tsp vanilla until mixed well. PREPARE DRY INGREDIENTS: Place 1 cup flour, ½ tsp baking soda and ½ tsp salt into a large bowl, stir to combine. COMBINE: Slowly add dry ingredients to wet ones and mix well. Now comes the best part – mix 10 chopped Oreos into the cookie dough. I chopped 5 of my Oreos pretty well, and the other 5 I just broke into chunks. Use a tablespoon or an ice-cream scoop to make cookies. I made 12 and spread them out 2-3 inches apart (I tried to spread them out that far, it may not have worked out with all 12 cookies on same cookie sheet). Since you need to spread the cookies with plenty of room between them, you might want to use 2 cookie sheets because they will definitely spread out and flatten out once in the oven. I used one cookie sheet and after baking the edges of some of my cookies touched each other as you can see on the picture below. Cannot emphasize enough – spread them out or use two cookie sheets! You can also chill the dough for an hour and up to 24 hours (if your self control is better than mine) – chilling will cool the butter in them and make them bake thicker. Bake for 15-19 minutes or until cooked, but still soft. Mine were done at 19 min, but a minute longer and they would’ve been too dry. Start checking on cookies at 15 minutes and check every minute (set a timer)! They will transform fast at the end of baking process. Once out of the oven, let cool on baking sheet for 5 minutes before transferring to cooling rack. 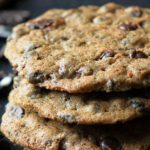 These Oreo Chocolate Chip Cookies are absolutely amazing and are full of Oreo chunks! They are super buttery, chewy and incredibly easy to make. Preheat oven to 350 degrees F and line a large cookie sheet with parchment paper. WET MIXTURE: In a large mixing bowl, beat the butter, light brown sugar and dark brown sugar sugar with an electric mixer until blended, about 1 minute. Add egg and 1 tsp vanilla until mixed well. FOUR MIXTURE: Place 1 cup flour, ½ tsp baking soda and ½ tsp salt into a large bowl, stir to combine. MIX THEM TOGETHER: Gradually add in the flour mixture into the wet mixture mixing with a spatula just until combined. Mix in the chopped oreos and chocolate chips with a spatula until evenly distributed. With an ice-cream scoop or a tablespoon, scoop onto a parchment lined baking sheet. Bake for 15-19 minutes or until cooked, but still soft. Mine were done at 18-19 min, but a minute longer and they would've been too dry. Start checking on cookies at 15 minutes!